Just watched the movie Letters to Juliet. 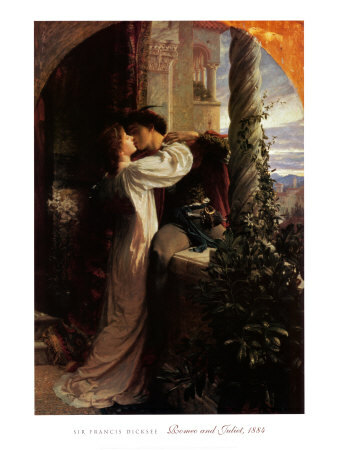 When I was a teenager I had posters on my wall of Romeo and Juliet, memorized scenes from the play which I can still recite, and lived a similar story of forbidden love except that I survived, my Romeo did not. Survivors guilt is a serious conflict. The love in this story endured time, distance and separation. Currently I am haunted by the love story of a dear friend who just lost her beloved to what seems to be a very untimely death. They were crazy about each other and looking forward to growing old together, with excitement. Caring about my friend, and trying to figure out how to be a helping spirit, strongly triggers recollections of my own marriage love lost to a death of a different kind, a confusion of events that obfuscated the love and let it sink into an underworld. A sunken ship. Letters to Juliet‘s opening had an exquisite slide show of paintings and photographs showing couples in the midst of passionate love stories. I couldn’t help but think that the artists who painted these scenes, and the love that inspired them to paint it, are all long gone, part of our collective history. So why trust love, why engage with it, why believe in it if its death is already in its birth? Because. Because of Hannah, who I wrote about yesterday, my 3-year-old mentor. Because life and death are one thing. Because there is no death without life, nor life without death. Because they work together to explode the heart into recognizing what is eternal. Time is an illusion, space is an illusion. Love is not. Every mystic from every tradition and every era will say the same. Does it help us with the loss of love in this time/space continuum? Barely. Only slightly. But the facts remain.